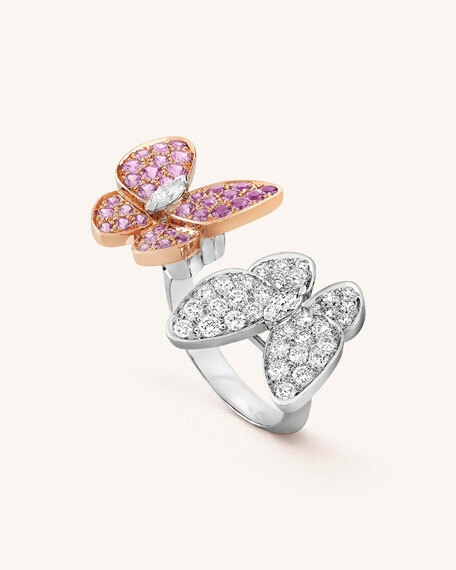 Van Cleef & Arpels Two Butterfly Between the Finger Ring. Polished 18-karat pink gold and white gold hardware. Two diamond and sapphire pavé butterfly ends. Prong-set marquise diamond butterfly bodies. White diamond pavé butterfly wings. Pink sapphire pavé butterfly wings. 34 sapphires; 0.88 total carat weight. 36 diamonds; 0.99 total carat weight.